Customization: No other marketing automation software company was willing to work with our website developer to build custom APIs that automatically create lists and manage their membership through user website activity. 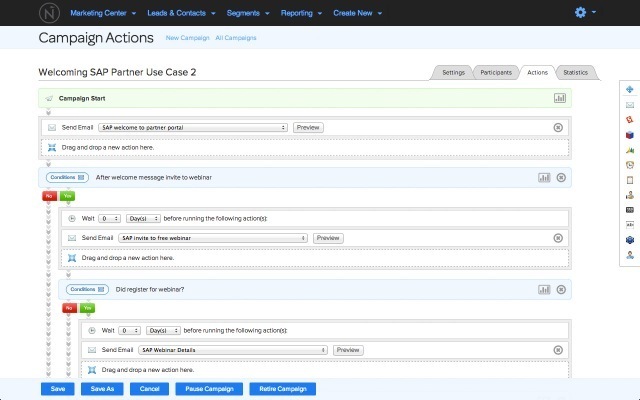 Nurturing campaigns: Automatically follow up with users who click emails, visit certain pages, complete forms, etc. Segmenting: Powerful engine for selecting groups or users based on wide range of criteria. Customer Support: Excellent, responsive immediately, friendly and smart! Dashboard customization - Net-Results has quite a few different dashboards to monitor different areas of the application. It would be great if they gave the user the ability to create a single consolidated dashboard that only contained the visualizations they were interested in. Alert email customization - Email alerts follow a standardized format. I would love to be able to use their awesome drag and drop email builder to build alert emails that get sent to our internal team. Net-Results is easier to use and we have been able to format emails that are more functional and look better. Tiered pricing by total email sends or total contacts, you decide. All features included. No upsells or limitations based on your price.